Talking fast and dreaming big, William Elong shows off the first “made in Cameroon” drone at his sixth-floor workshop in downtown Douala, minutes from the economic capital’s Atlantic seafront. 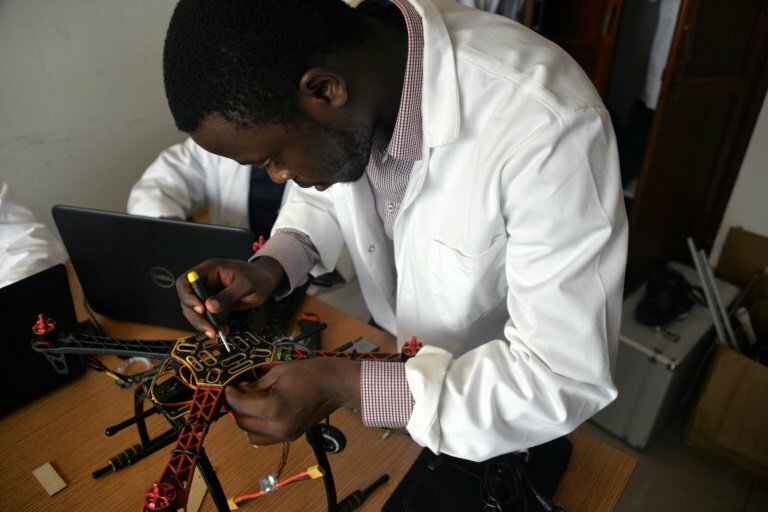 The 25-year-old, known as a high-flyer after being named one of Forbes’ most promising young Africans under 30, is enthusing about his new unmanned aerial drones and keen to promote his company and Africa as a place where IT and new tech can flourish. We must “get out of the Afro-centric vision of business” to “understand that when one has a global vision, worldwide, this includes Africa,” Elong says in a discussion of future technologies. Elong has no degree in IT or robotics but studied strategy and competitive intelligence in France, becoming the youngest-ever graduate from Paris’ Economic Warfare School. He founded his startup Will & Brothers in 2015 with a main project called Drone Africa, which aims to provide drones for civil purposes to businesses, the state in Cameroon and elsewhere. With a top range of up to 20 kilometres (12 miles), the drones can be used for purposes as different as cartography, media coverage, support for agriculture and detecting gas in mines to reduce the risk of accidents. “The know-how is here, in Cameroon,” says Elong, who is aware young African talent often seeks employment in Europe and elsewhere. He says at this stage his firm’s capital of $200,000 (162,400 euros) has come from Western backers. Also supported by the government of President Paul Biya, Elong hopes eventually to raise $2 million to expand the business but he regrets that “not many Africans are involved” in the project, which features two airborne types of drone and one terrestrial model. The commercial market in Africa is expanding with unmanned aircraft already whizzing across the skies delivering items like medicine and food, and even helping farmers sow seeds. 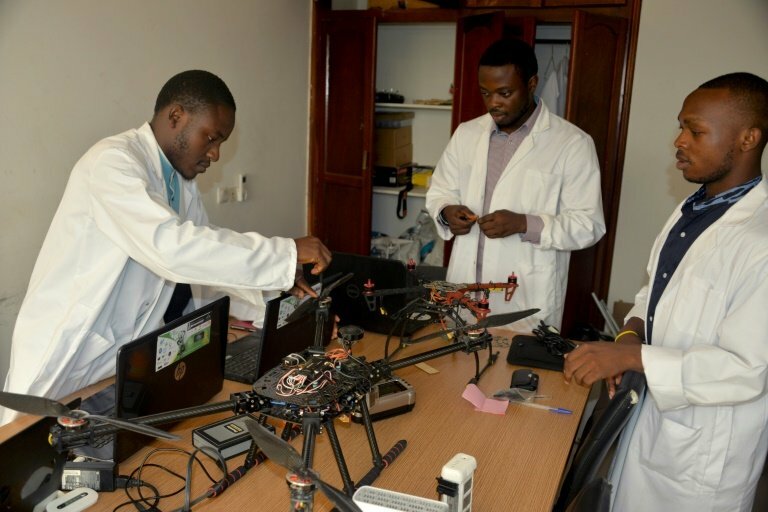 In Rwanda, drones get medical supplies such as blood and vaccines to remote areas. Tanzania is launching a similar programme. And drones equipped with night-vision cameras help to detect and track poachers in Kenya, Namibia, South Africa and Zimbabwe. Elong presents the two airborne prototype models on a table inside his assembly shop. The first “flying wing that we’ve baptised Algo” has the furthest range and could prove an economical solution to the costly task of making maps, he suggests. The second type, known as Logarythm, has four arms forming a propeller, can reach an altitude of up to 500 metres (1,640 feet) and is fitted with high-definition cameras, which would be useful in high-risk zones and for precision work, Elong adds. Crucially, he argues, manufacturing costs are lower than those of foreign manufacturers, so the drones produced will be priced competitively across the African marketplace. Elsewhere, two young engineers in white lab coats are carefully building a prototype. “When all the components are available, we are able to assemble a drone like this in 24 hours,” says engineer Louis Ekani. Some of the parts are made in Cameroon, while others are supplied from abroad. The average age of employees is barely 22 and the team comprises mainly engineers and developers who have spent two years building airworthy drones. “Will & Brothers is the pride of Cameroon,” gushed Minister of Posts and Telecommunications Libom Li Likeng at a government ceremony to present the drones in early February. Their design demonstrates “the innovative capacity of Cameroonian youth”, she added. Elong’s firm is represented in Ivory Coast and plans to open offices in France and the United States, but he stresses the development of artificial intelligence is his primary goal. Will & Brothers has worked on an AI known as Cyclops, which enables drones to detect people, objects and vehicles and to identify different types of animal at specific sites.